Digital currency trading is a high risk (potentially high reward) activity. Anyone can go on one of the major exchanges and buy low / sell high and generate money from effort (the more effort the higher the profits.) Bitcoin is not the only digital currency; there are thousands of them and the prices fluctuate all the time. For a human it is nearly impossible to monitor all the markets continuously, selling during short term price spikes and then buying back in when the prices fall to maximise profits, but for a computer this is not difficult. The TREX software product works for you nonstop trying to grow your investment value by taking advantage of the huge volatility of digital currency markets. TREX takes a low risk approach to high risk markets, it does not try to manipulate those markets and never will. Digital Currency trading is like gambling, but the main difference is that when gambling at a casino the odds are always stacked against you. The core business aim of bandwagonhunter.com is to provide members/users with digital currency trading software that (when configured sensibly) stacks the odds in your favor, so that more often than not (and on average) you are making good profits using the software. Click here to see an example short session of TREX in "Automatic Trading" mode. Imagine if you could add another income to your household. Say for example if you could get a bank account but instead of interest being paid yearly, you got it paid weekly. A $10,000 investment would generate $200 per week interest at 2% and wouldn’t that be nice. The software that we supply to members is capable of growing your digital currency coin count by over 5% almost every week. It manages your digital currency investments on the main Bittrex exchange where your funds are located. TREX simply takes advantage of the frequent price spikes and grows the number of coins you own using a simple sell high buy low approach. Enough hedging is used to offer a high level of consistency. It works, it’s secure, and it can grow your investment by around 1% in around 30 hours while markets are fairly flat (it can perform much better when markets are rising.) It uses digital currency so this is a high risk; possibly high reward offering. There is also no commitment necessary, you don’t have to sign anything and if you feel at any point that access to the software is not worth the payments involved, you can stop making payments by simply stopping using the software. The name “TREX” is actually derived from a limitation of the application: The only digital currency exchange the software uses is BitTREX. To use TREX you will need an account on Bittrex and some currency in bitcoin to get started (no less than the equivalent of $250 USD is recommended. However a better situation would be a four figure number, although you should make sure you are comfortable with the level of your investment.) The software will also be effective with much larger amounts. You can use TREX to buy new currencies with your bitcoin. Please note: there is no affiliation or business relationship between bandwagonhunter.com and Bittrex. Please see the Quick Start Guide to find out more. The TREX application manages your funds on Bittrex in real time. Digital currency markets are highly volatile and the whole aim of TREX is to take advantage of this volatility in an attempt to make you profit (by growing your digital currency coin count using a simple Sell High/Buy Low approach.) Your funds are always stored on the Bittrex exchange and never stored by TREX or bandwagonhunter.com. The chart below is a screenshot from a Bittrex market: BTC-ADX. As you can see there is a variance in price of around 20% over a 30 hour period. If you owned 100 ADX coins, the value at the end would be exactly the same as it was 24 hours previous. The price spike that occurred is a missed opportunity to profit. You could try to monitor all the markets constantly so that you don't miss out on opportunities to profit (and sacrifice your free time) or you can use TREX to do it for you. DISCLAIMER: The image above is a screenshot from a Bittrex market. 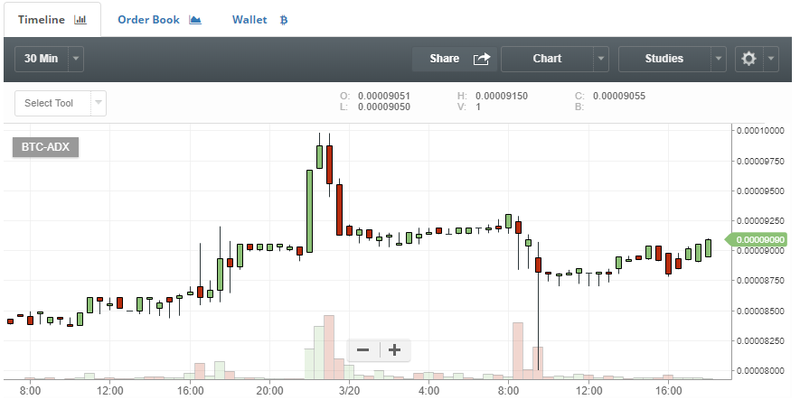 The image is being used for illustration purposes only, bandwagonhunter.com takes no credit for the creation of this image, this is how the highly user friendly Bittrex platform shows price data. The loan/repayment mechanism usually requires several days to build a solid foundation in profit (setting Max Group loans lower can speed up this process, but can also limit profits for longer automatic trading runs.) TREX is designed to be "always on" so any initial loses are expected as TREX performs initial loans incurring Bittrex fees, before many repayments have occurred. Eventually the number of repayments will far exceed the number of open loans and outweigh all Bittrex and bandwagonhunter.com fees and the consistent climb, from initial loss to ever growing profit should continue. (At least that’s the intended behavior of the software, market activity can, on occasion make this a delayed start so be patient and have faith, and way more often than not (and on average) you will make good profits using the software. To maximise the profitability of TREX it is important that you have multiple “loans worth” of a currency for TREX to use when prices spike and it sells out. This is important because if the price spike continues, TREX would like to sell again but if the funds aren’t available it can’t. You can control the size of a loan. Try to avoid having less than 2 loans worth in most of your currencies, the more the better. It is also important you have plenty of BTC and TUSD. These currencies are treated differently to all other currencies, because bitcoin is normally heading in the opposite direction of other coins as money flows between markets, and TUSD is linked to the dollar so is not volatile like nearly all other crypto currencies. TREX will aim to move your funds to where the rises or the stability is, while simultaneously growing group coin counts using the loan repayment mechanism. The automated digital currency trading software that we supply to members has a built in mechanism for paying for your usage of the software. To enable this functionality, users supply the software with their Bittrex "withdraw API Key and Secret" (Bittrex API values can be accessed here when logged into Bittrex: Select Settings then API Keys.) TREX will also need the equivalent "Read Info" and" Trade Limit" API Keys and Secrets to operate. Once configured correctly, TREX can transfer a fee directly out of one of your wallets on Bittrex to bandwagonhunter.com (the fees will always be small, fully transparent and can be completely controlled requiring your email authorisation through Bittrex for every payment.) Further details can be found on the Pricing page. We believe this payment system allows the user to control how many payments are made to bandwagonhunter.com because you can stop using it at any time and all payments will immediately and permanently cease (until you start using the software again.) For anyone who has ever had a gym membership that was not utilised to the maximum, it should be easy to see the advantages of this type of payment system. It should be noted that Bittrex charges trading fees too, but all profit/loss values that TREX displays includes these fees, along with bandwagonhunter.com fees, so nothing is hidden from you. The Pricing page provides the details of our charging mechanism in its entirety. THERE ARE NO HIDDEN CHARGES OR FEES and TREX will try to maximise your profits at every opportunity, trying to get the best trading prices for your benefit, not ours. 1. Do an "automatic trading" run for a few days, the loan/repayment mechanism means there is an underlying upward trend once the loan book fills, so any initial short term loses will nearly always be temporary. Close the application. 5. Restart TREX in Automatic mode and leave it for several/days or weeks. Go to Step 1: Keep repeating. Marginal increases now can lead to big profits later if prices soar. Once you get the hang of it the whole process takes about 5 to 10 minutes of your time. While "automatic trading" your PC or laptop should remain ON allowing TREX to operate, but even with an old machine it will remain fully usable for other tasks, because TREX does not need much memory or processor capacity to operate effectively. While in "automatic trading" mode there is a high risk of temporary losses while the loan book fills for two reasons: 1. Bittrex charges a small fee for every trade (there are two trades in each loan and two trades in each repayment.) 2. "Ratio Repayments" can payback at as low as 5% profit while loans that have went the wrong way can continue to fall. Once the loan book fills the only way TREX can do most loan types is for a repayment to occur so the climb to profit begins. It is important to configure "Max loans per group" for the length of the run you intend to do: The higher you set this value the longer you will have to wait for what will likely be higher profits: once the loan book fills the rate of climb can be greater for groups with higher limits.) As a general observation, most of the time once you have more ratio repayments than open loans losses have already turned into profits; and the climb continues.